P1 quesadillas, half-priced wine, free ribs, and more! (SPOT.ph) This week, we found out that UCC is giving away P15 coffee, Buffalo's Wings N' Things is giving away free wings, and Outback is giving away free ribs. 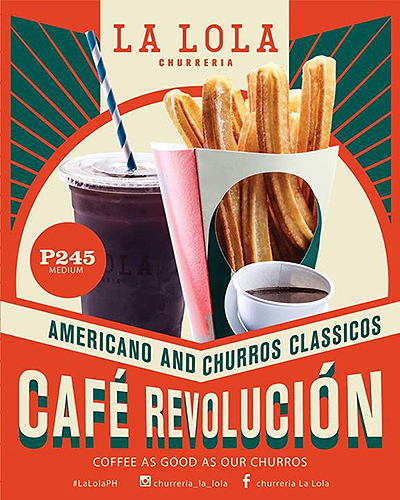 Plus, Churreria La Lola has an amazing deal that will make you want to enjoy your churros with chocolate and coffee. 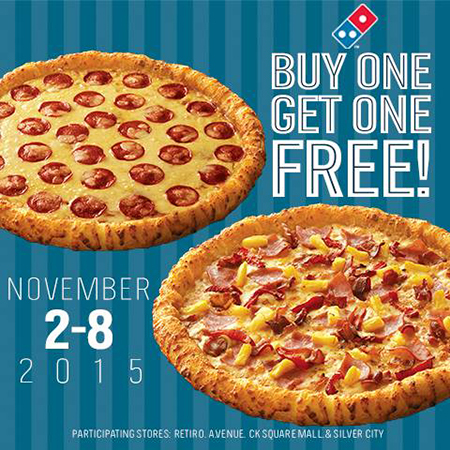 Once again, this pizza chain is busy selling buy-one-get-one pies. Prices range from P129 to P479, depending on the size. This time, it's only until November 8. In Manila, this deal is only available at the following branches: Retiro Street, Quezon City; A.Venue, Makati City; and Silver City, Pasig City. 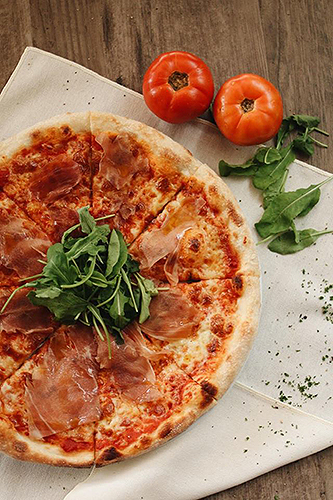 Order any of Kuppa's made-from-scratch pizzas , gambas, or salpicao, and you can get 50% off or buy-one-get-one on their house wines. Kuppa Roastery Cafe is at Commercenter Building, 4th Avenue corner 31st Street, Bonifacio Global City. 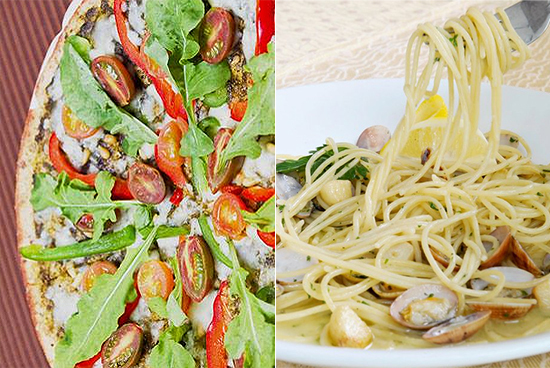 Planning a lunch with the whole family? Have it at Jade Garden. Order their lunch set on weekdays until November 13 and you only pay half price. 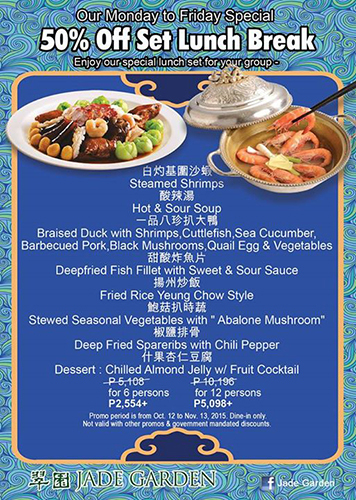 The set already comes with duck, abalone mushrooms, steamed shrimps, spareribs, and dessert! You can get the best deal by bringing six to 12 people. Jade Garden is at Glorietta 2, Makati City. Get medium Churros Classicos with a medium Hot Chocolate dip and a cup of Americano for only P245. This is only until November 9. Visit a Buffalo's Wings N' Things branch today and sign up to be a member of their Birthday Club (it's free). Once your membership is activated upon e-mail, you get a free welcome appetizer, as well as dibs on deals. 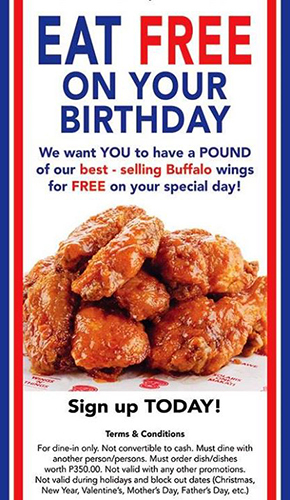 On your birthday, they'll give you a pound of Champion Buffalo Wings for free! 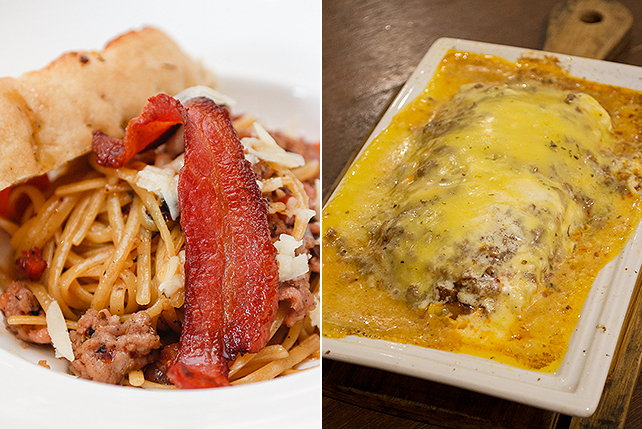 B.Y.O.B.—bring your own barkada to Nacho Bimby after school. 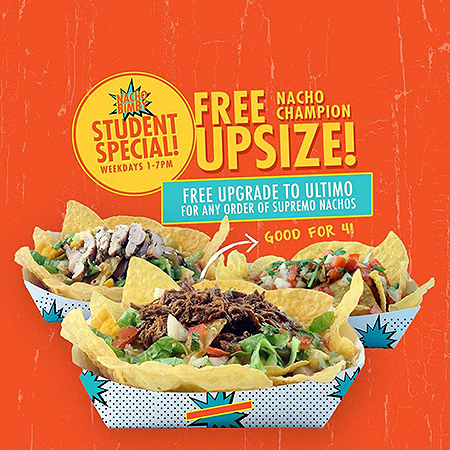 From 1 p.m. to 7 p.m., weekdays, every order of the Supremo nachos will be upgraded to an Ultimo (it's good for four people). This deal is only available to students and a valid I.D. must be presented. Nacho Bimby is at Promenade Mall, Greenhills, San Juan City. 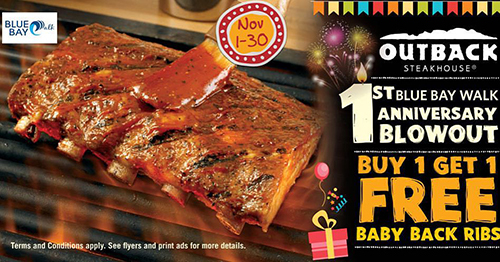 Outback Blue Bay Walk has just turned one and this entire November, they're offering their famous Baby Back Ribs two for the price of one. Happy birthday, Puñta Manila! 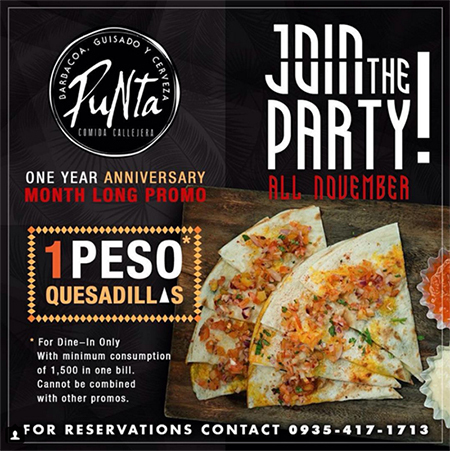 For this milestone, every P1,500 single-receipt purchase is rewarded with P1 quesadillas—available all November. Puñta Manila is at Mandala Park, Shaw Boulevard, Mandaluyong City. 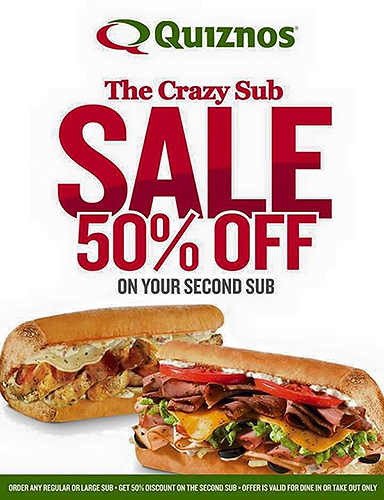 Order a regular or large sub at Quiznos and you can get a second one for half price. The offer is valid for dine-in and take-out transactions. It's available this November, but Quiznos hinted that they might extend the deal. 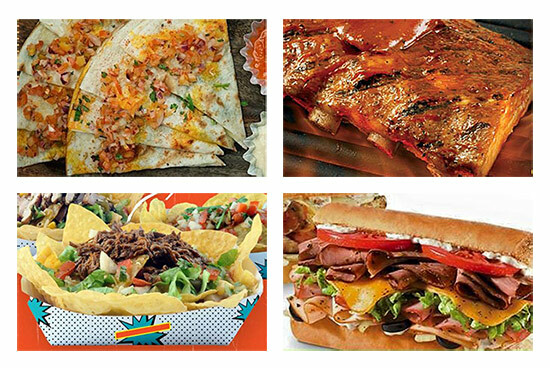 Click here for a list of Quiznos branches. It's UCC's 15th anniversary! 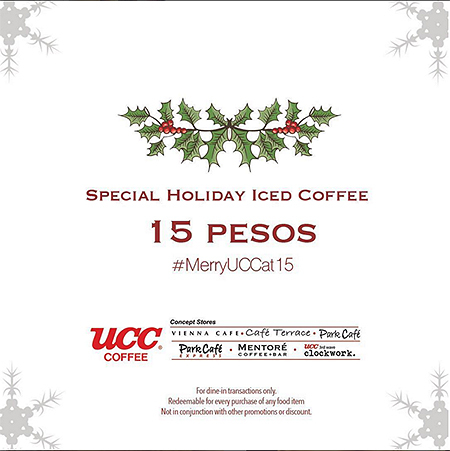 Buy any food item from any UCC outlet (Park Cafe, Mentore, Clockwork, Cafe Terrace, et cetera) and you can get the special holiday iced coffee for only P15.